Objective : To study the distribution and treatment results of patients with carotid body tumors (CBT). Setting : Tertiary care center, South India. Materials and Methods: Nineteen patients with carotid body tumors seen over the last 15 years of whom 16 were operated upon. Outcomes : Operating time, intraoperative blood loss, in-hospital morbidity and mortality and recurrence at one year were studied. 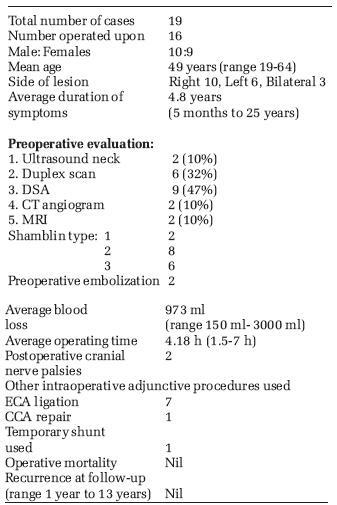 Results : Of the 19 patients studied, 16 were operated upon of whom two developed postoperative cranial nerve palsies. Careful subadventitial dissection was used for all patients, however, with better techniques over the years the results, in terms of blood loss and operating time, have improved. External carotid artery was ligated in seven patients. One patient needed repair of the common carotid artery and another needed temporary shunting and reanastomosis for injury to the proximal internal carotid artery. Two patients had preoperative embolization of the tumor. One of these patients did better than the other in terms of operating time and blood loss. At one-year follow-up, no recurrences were noted. Conclusions : Excision of a CBT is recommended at the time of initial diagnosis in patients in good general health to avoid the difficulty of subsequent excision of an enlarging and highly vascular tumor with possible encasement of the carotid arteries. Meticulously subadventitial dissection and excision is the key to achieve complete excision with minimal morbidity. This method should therefore be used for the excision of CBT. Facilities for shunting and arterial repair should always be available. In 1743, Von Haller first described the carotid body, a chemoreceptor buried in the adventitia on the posteriomedial aspect of the carotid bifurcation. Lushka first described tumors arising out of the carotid body or carotid body tumors (CBT) in 1862. Maydl first successfully removed a CBT in 1886 but the patient developed aphasia and hemiplegia. Scudder in 1903 successfully removed a CBT without nerve injury and sparing the carotid vessels. Since then many techniques have been tried for the excision of CBT but the method of careful subadventitial dissection has proved to be the most successful. At present, controversies continue regarding the role of preoperative angiographic embolization, the use of carotid shunts and the role of radiotherapy for malignant disease. Here we review our results of treatment of CBT in our institution over the last 15 years. The aim of our study is to evaluate the distribution and treatment results of patients with CBT. 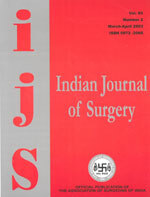 All inpatient and outpatient records of patients treated for CBT in the Department of General Surgery, Christian Medical College, (CMC) Vellore between 1990 to 2005 were traced using ICD codes and analyzed. Between 1990 and 2005, the Department of General Surgery Christian Medical College, Vellore, treated 19 patients with CBT. Ten were male and nine females with a mean age of 49 years (range 19 to 64 years). Three patients had bilateral disease. Of the unilateral tumors, ten were on the right and six on the left. The commonest presentation was that of a slow-growing mass (in 18 of 19 patients) noticed over a mean duration of 4.8 years (range 5 months to 25 years). Six had undergone previous operations at other centers, three with a preoperative diagnosis of CBT and three were attempted lymph node biopsies. Of the 19 patients, 16 were operated upon here at CMC. Three patients were not operated upon as two had extensive, inoperable, malignant disease and were referred for radiotherapy and one patient was advanced in age with a slow-growing asymptomatic tumor and hence kept on follow-up. Only the two patients who had presented with extensive inoperable disease had cranial nerve palsies at presentation (involvement of the 9th, 10th and 12th nerves). These two patients were also cachexic. There was no indication of familial predisposition in any of the cases. None of the patients had endocrinologically active tumors at presentation. In two patients (10%), the diagnosis was based on ultrasound of the neck and these patients were operated upon without further imaging. In six (32%) a Duplex scan was used to confirm a clinical suspicion of CBT. Nine patients (47%) underwent digital substraction angiograms and two (10%) CT-angiograms to diagnose delineate tumor size and extent and locate feeding vessels. Two patients (10%) had MRIs in addition to one of the above to help assess the extent of the tumor. Sixteen of nineteen patients had CBTs resected with an average operating time of 4.18 h (range 1.5 to 7 h) and an average blood loss of 973 ml (range of 150-3000 ml). Once proximal and distal control of the carotid vessels had been secured, the tumors were resected by meticulous subadventitial dissection. The tumors ranged in size from 3 to 8 cm in diameter. They were grouped into the three Shamblin categories - two were Shamblin 1, eight Shamblin 2 and six were Shamblin 3. The external carotid artery was ligated in seven patients. In one patient, the common carotid artery (CCA) was injured during dissection and was repaired. In another the proximal internal carotid artery (ICA) was inadvertently injured needing temporary shunting followed by resection of a segment and reanastomosis to the CCA. There was no in-hospital mortality and none of the patients developed perioperative cerebrovascular complications. Two patients (10%) developed postoperative cranial nerve deficits (9th, 10th, 12th) and one of them was discharged on a nasogastric tube for feeding. None of the patients developed Horner′s syndrome. The average postoperative hospital stay was 4.18 days (range 3-8 days). All tumors were confirmed to be CBT on biopsy. Two patients had preoperative embolization. The first was in early 2000. The tumor was a large Shamblin 2, which had been previously operated upon. The duration of surgery was five and a half hours with a blood loss of 1300 ml. The patient developed postoperative cranial nerve palsies. The second patient was operated in 2005. This was a recurrent Shamblin 3 tumor. The duration of surgery was three hours with a blood loss of 300 ml. The patient had an uneventful postoperative period. Follow-up ranged from 12 months to 13 years. Seven patients were lost to follow-up after an initial review at one year when they had no recurrence. Twelve patients visited to the hospital for various reasons and have not been found to have any recurrence to date. However, two of the operated were disabled by problems related to the postoperative cranial nerve palsies and continue to visit the hospital. The carotid body is derived from both mesenchymal elements of the third branchial arch and neural crest elements originating from the neural crest ectoderm. As neural crest cells migrate in close association with autonomic ganglion cells, neoplasms arising from these migrating neural crest cells are referred to as "paragangliomas" or chemodectomas. Therefore, paragangliomas can occur in along the jugular venous system, vagus nerve and ganglia, aortic arch, visceral autonomic system and adrenal medulla, apart from the carotid body. 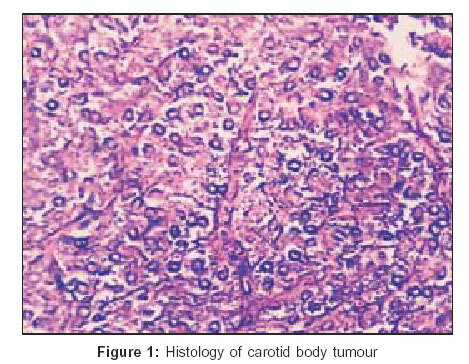 Histologically, cervical chemodectomas resemble the normal carotid body architecture. The tumors are highly vascular and between the many capillaries are clusters of cells called Zellballen or cell balls. Two types of cells make up the Zellballen, one the sustentacular or supporting cells and the other are epitheliod or chief cells, which have finely granular eosinophilic cytoplasm containing epinephrine, norepinephrine and serotonin as can be seen using cytochemical techniques [Figure - 1]. Paragangliomas can be of the chromaffin or the nonchromaffin variety. The former can present with a pressor-amine syndrome characterized by dizziness, flushing, palpitations, tachycardia, hypertension arrhythmias, headache, diaphoresis and photophobia due to the production of epinephrine, norepinephrine and serotonin. Though rare, forming less than 0.5% of all tumors, CBT is the commonest variety of paraganglioma and the only pathology to affect the carotid body., Their etiology is unknown though hypertrophy of the carotid body and the incidence of CBT are higher among those living at higher altitudes and exposed as a result to relative hypoxia. This has been seen in reports from India where patients often hail from high altitude areas like Himachal Pradesh. Recent biogenetic discoveries reveal that mutations in oxygen-sensing genes are another etiology, accounting for approximately 35% of cases and that these two etiologies are probably additive. Carotid body tumors may be sporadic or familial. Familial tumors account for 10% of all CBT. They have an autosomal dominant mode of transmission and are characterized by the higher incidence of bilateral tumors, 32% versus 5% bilateral tumors in the sporadic form. Carotid body tumors often present as asymptomatic masses. This has been the case even in Indian studies. These masses progress steadily in size and can lead to hoarseness, dysphagia and Horner′s syndrome with about 20% having cranial nerve involvement. Only 5% of CBT are endocrinologically active and hence in the absence of hypertension or other symptoms of the pressor amine syndrome, screening for catecholamine metabolites in patients with cervical chemodectomas is unwarranted. Group I	consists of relatively small tumors, which are minimally attached to the carotid vessels; surgical excision is not difficult. 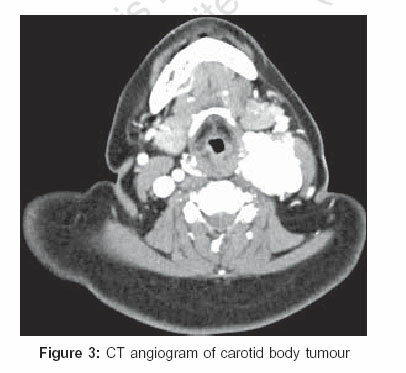 Group II	tumors are larger, with moderate attachment to the carotid vessels. These tumors are amenable to careful surgical excision. Group III	tumors are very large, encasing the carotid vessels and often require arterial resection and grafting. 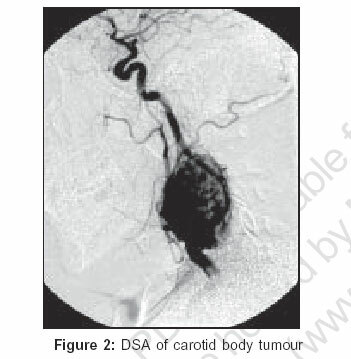 Generally, tumors larger than 4-5 cm tend to have partial or complete encirclement of the carotid arteries. The reported rates of malignancy range from 2 to 50% in the literature.,,, The malignant potential of these tumors is predicted only by the presence or absence of lymph node or distant metastasis and not by grade, size or other histological markers. These tumors may rarely metastasize to the kidney, thyroid, pancreas, brain and lungs. Though slow-growing, an argument previously quoted by those against early surgical treatment, about 5% of these unresected tumors have an unrelenting growth resulting in encasement and infiltration of adjacent neurovascular structures. Hence, excision of a CBT is recommended at the time of initial diagnosis to avoid the difficulty of subsequent excision of an enlarging and highly vascular tumor with possible encasement of the carotid arteries and higher chances of postoperative complications like cranial nerve palsies. Radiotherapy for CBT has been largely unsatisfactory, except for control of residual or recurrent disease. Chemotherapy has no role. A death rate of 8% in reported in untreated patients, with death occurring due to intracranial extension and asphyxia. The carotid body normally obtains its blood supply from the ECA through the ligament of Meyer, but as the tumor grows, it recruits neovascularity from the ICA, vertebral artery and thyrocervical trunk. As angiography would delineate this neovascularity and help in exposure and hemostasis, it has been the gold standard for the diagnosis of CBT. Splaying of the carotid bifurcation with a tumor blush known as the ′lyre′ sign is classical to CBT [Figure - 2]. However, Duplex scans, CT angiograms and MR angiograms are now becoming the accepted modalities of preoperative imaging with the added advantage of being able to image the opposite side to rule out bilateral tumors. Duplex scan will show a highly vascular mass in the region of the carotid bifurcation [Figure - 3]. The role of preoperative embolization of highly vascular tumors is controversial. Preoperative embolization has been reported to be useful in decreasing vascularity and hence improve the safety of surgical excision, with lower operative blood loss and decreased technical difficulties. However, it carries the hazard of ICA thrombosis and cerebral embolization. In our series the two cases who underwent preoperative embolization, were contrasting in terms of operating time and blood loss. The plane of dissection to excise a CBT is not through the tunica media but is along the subadventitial plane described by Gordon-Taylor as the ′white line′ [Figure - 4]. In our series we have seen that our results in terms of operating time and blood loss have improved considerably with training and improved techniques of subadventitial dissection. 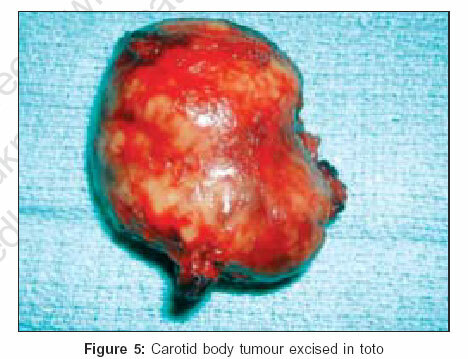 The tumor can hereby be excised in toto [Figure - 5]. Preoperative embolization though useful in selected cases (large, highly vascular recurrent tumors), is no substitution for careful subadventitial dissection. Tumors, which are associated with the pressor amine syndrome, are operated upon only after adequate alpha blocking to bring down the blood pressure followed by beta blocking to reduce the heart rate. Alpha blockers like phentolamine or phenoxybezamine are started two to three weeks prior to surgery. Beta blockers used can be propronolol, esmolol, atenolol or metoprolol. This is the same as the preoperative preparation for phaeochromocytomas. Preoperative evaluation would also include urinary vanillylmandelic acid and nuclear scans, either MIBG or octreotide scan. If there is lymph node spread within an operable limit the radical neck dissection can be combined with the primary excision of the tumor. Excision of a CBT is recommended at the time of initial diagnosis in patients in good general health to avoid the difficulty of subsequent excision of an enlarging and highly vascular tumor with possible encasement of the carotid arteries. 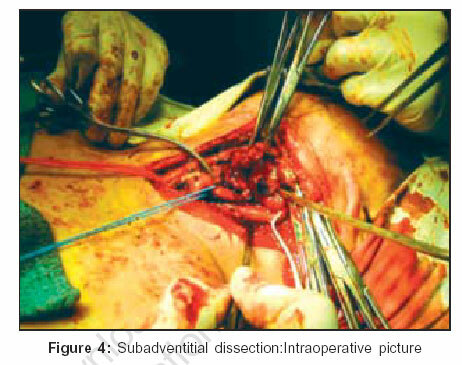 Meticulous subadventitial dissection and excision is the key to achieve complete excision with minimal morbidity. This method has to be therefore used for the excision of CBT. Facilities for shunting and arterial repair should always be available.